APOCALYPTO is a heart-stopping, mythic action-adventure set against the turbulent end times of the once-great Mayan civilization. When his idyllic existence is brutally disrupted by a violent invading force, a man is taken on a perilous journey to a world ruled by fear and oppression where a harrowing end awaits him. Through a twist of fate and spurred by the power of his love for his woman and his family, he will make a desperate break to return home and to ultimately save his way of life. 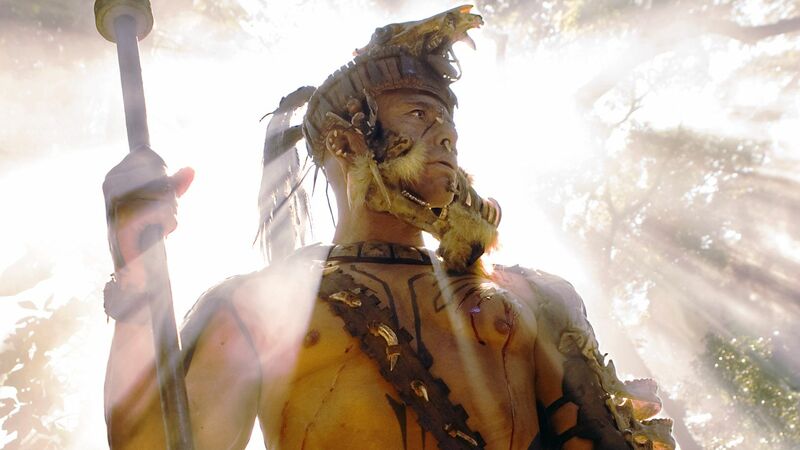 Visceral, thrilling and boldly thought-provoking, APOCALYPTO brings to life, through Gibson's ambitious creative vision, a world from the ancient past hereto never before seen on the modern screen that speaks powerfully to our lives today. Shot on location in Catemaco -- in one of the last remaining tracts of rainforests left in Mexico -- and in Veracruz, with a cast made up entirely of indigenous peoples from the Americas, APOCALYPTO is directed by Mel Gibson, produced by Gibson and Bruce Davey and written by Gibson and Farhad Safinia, who co-produces. The executive producers are Ned Dowd and Vicki Christianson. The behind-the-scenes team, who spent intense months shooting in the jungle and recreating a spectacular Mayan kingdom of soaring pyramids and mysterious temples, includes Academy Award-winning director of photography Dean Semler ("Dances With Wolves"), two-time Academy Award-nominated production designer Tom Sanders ("Saving Private Ryan," "Dracula," "Braveheart"), two-time Oscar®-nominated film editor John Wright ("Speed," "The Hunt for Red October," "The Passion of the Christ") and Oscar®-winning composer and multiple Academy Award nominee James Horner ("Titanic," "A Beautiful Mind," "House of Sand and Fog," the forthcoming "The Good Shepherd"). Powerful Maya kingdoms ruled in the Americas for more than 1,000 years, forging expansive cities, constructing sky-piercing pyramids and building an impressively advanced society of extraordinary cultural and scientific achievement. Then, in a flash of history, this world collapsed. All that was left behind were a few jungle-covered pyramids and a tantalizing mystery. Now, 500 years after the end of the Mayan civilization, director Mel Gibson delves into this never-explored realm to create a modern screen adventure which unfolds like a timeless myth about one man's quest to save that which matters to him the most in a world on the brink of destruction: APOCALYPTO.